There’s a certain anxiety in the VR community that surfaces in many conference panels and interviews with industry leaders: plenty of veterans are worried that this latest flowering of the technology will end with the same commercial disappointment that we saw in previous decades. This is often framed in terms of quality, the fear being that VR systems and content will be pushed into the mainstream market before the kinks are worked out. Users will have unpleasant, confusing, or underwhelming first experiences, and the whole sector will suffer a(nother) fatal backlash. But what does quality mean in VR? Can we break this concept down into smaller pieces? Who is responsible for each aspect of quality, and what parts of the technology stack are implicated in each one? Most importantly, how can a better understanding of these issues help us to produce more effective and successful VR experiences? 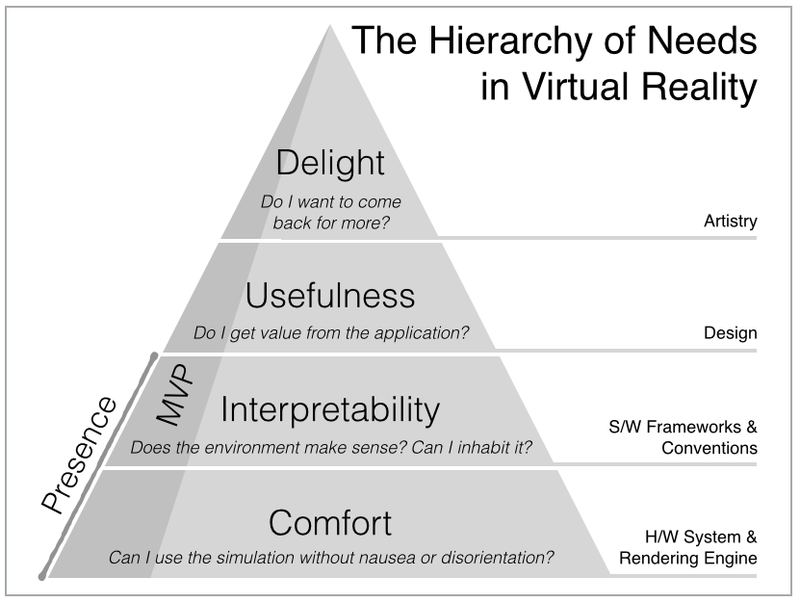 We’ll take inspiration from Maslow’s classic formulation, and propose an analogous hierarchy of needs in VR: starting with Comfort, followed by Interpretability and Usefulness, and capped with Delight. To be successful, a VR experience must address all of these levels. Comfort encapsulates some very basic requirements, many of which concern the accurate rendering of the simulated environment in immediate response to head and bodily movements. This level is all about meeting our deeply unconscious expectations about the nature of our sensory inputs, and how they interact with our actions. It is largely the responsibility of the VR hardware such as the HMD and graphics processor, as well as the engines used to author and render the content or application. Interpretability describes our need for the simulated environment to make sense: to be grokkable by our senses, to contain enough cues to orient us without being overwhelming, and to follow the logic — usually taken for granted — of everyday lived experience. VR can certainly bend some of the rules of physics: we can fly, exhibit super-human strength, and even warp time and space. But these enhanced experiences must be quantitative and metaphorical extensions of normal life, rather than completely de novo creations. Another way to think about Interpretability is that, of all the stimuli that we can create with VR systems, only a vanishingly small fraction of them will make any sense at all to our perceptual systems. The better we understand the rules that govern these constraints, the more efficient we’ll become in creating immersive environments. For this reason, Interpretability largely relies on rules and conventions, though it can be greatly aided by software frameworks that channel creativity in the right directions. Usefulness is a highly application-specific concept, but it really comes down to value: did the VR experience deliver on its basic value proposition? Did the movie tell a story that made sense? Did the telepresence session enable rich, high-fidelity communication? Did the virtual walk-through deliver an accurate sense of the home you’re thinking of buying? This is the province of design and craft, supported by professional authoring tools. Finally, Delight is the realm of artistry. Did the movie leave you thinking for days afterward? Was the telepresence session almost as good as visiting with family in real life? Did you fall in love with the home — and make an offer? We earn the right to strive for Delight by first conquering the lower-level needs through engineering, craftsmanship, and attention to detail. While these levels are distinct, the boundaries between them are still quite leaky. As an astute early reader pointed out, the tools and frameworks need to mature considerably before, say, a game designer can feel well-insulated from basic issues of Comfort and Interpretability. As in Maslow’s original hierarchy, it makes little sense to worry about the higher levels before the lower ones are in place. One interpretation of the recent renaissance in VR is that Oculus finally cracked the Comfort code, through a combination of low weight, wide field of view, and fast, accurate head tracking. People have long had ideas about how to provide Interpretable, Useful, and Delightful VR experiences, and now we can finally try them out. My sense is that the first two levels, Comfort and Interpretability, largely determine the feeling of presence. The user must be at ease in the simulation, and the environment must “read” as natural — not necessarily realistic, but obeying the basic expectations we carry about how our body interacts with its surroundings. If these conditions are met, then you’ll feel as if you’re inhabiting the simulation; of course, whether it’s useful and emotionally engaging are separate questions! An MVP experience should attempt to cover a vertical slice through this entire hierarchy, ideally extending from Comfort all the way up to Delight. On the one hand, it would be foolish to think that addressing Comfort and Interpretability is enough — why would people want to continue using the experience, or recommend it to friends if it’s not useful and enjoyable? And skipping to Delight without ensuring, say, Comfort is also a recipe for disaster: no one will be able to appreciate your artistry while turning green. Finally, these levels also map in interesting and non-obvious ways to the brain systems that support immersive VR experiences. I’ll be using this hierarchy as the organizational framework for the book I’m currently writing on the neuroscientific basis of VR; you can follow that project on Twitter. Please offer your comments and feedback! Thanks to Chris Dixon, Tony Parisi, and Max Gasner for providing feedback on an earlier draft of this post.